Thousands of people die each year in Europe as a result of working with asbestos. Thousands of people die each year in Europe as a result of working with asbestos. Although the use asbestos has been forbidden since 1990, there are still plenty of old buildings with insulation, walls or roofs containing asbestos. At some point of time these buildings need also be renovated or demolished. Asbestos is a name for a group of inorganic fibrous silicates with a clearly defined crystalline fibre structure. Asbestos dust is composed of long, slender fibres which are a few thousandths of millimetre long. Because they are so small, they get into the deepest part of the lung. Additionally they have barbs and due to it they can cause serious damage in the lungs. Pictures: Asbestos and asbestos lung. 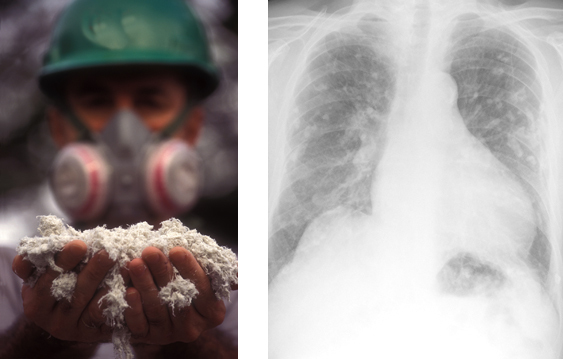 Any contact with asbestos causes a high risk of developing lung cancer (bronchial cancer). Smoking increases the risk even further. Is a malignant tumour. In particular krokidolit, which was used in the cement of old buildings, increases the risk of developing mesothelioma. Asbestos deposits in the lungs and irritates the lung tissue constantly. This increases the connective tissue content of the lung, meaning the lung area needed for breathing gets smaller and smaller. This leads to difficulty in breathing. Breathing moves the pleura. The inhaled asbestos fibres can migrate through the lung tissue and implant themselves in the pleura. This leads to scarring, called pleural thickening. It can take years until the cancer or other diseases caused by asbestos are diagnosed. This means that some effects caused by asbestos can occur after 25-30 years. Also the collapse of the Twin Towers on 9/11 released asbestos. Over 60 per cent of the helpers have been since diagnosed for asthma attacks and respiratory problems. They all suffer from shortness of breath, sinusitis and dry cough. The health effects were downplayed at the time, but it is beyond doubt that the two buildings contained asbestos fibres and the long-term consequences for the helpers will show themselves in the coming years. How can you protect yourself whilst working with asbestos? When renovating or demolishing buildings containing asbestos certain special measures have to be put in force. These range from breathing protection, source extraction, special tools and especially for this kind of work designed dust extractors to decontamination of work clothes after use. The regulations differ from country to country, but better safe than sorry. After all it is your lungs affected.